Leaders in all industries are constantly wondering how to improve company culture. There are myriad benefits to achieving world-class culture, not the least of which are: higher profitability, improved customer service, enhanced talent attraction, and superior talent retention. Below are six of the most unique and proven means of achieving a best-in-class organizational culture. Three of the six secrets were discovered by noticing three consistent commonalities among the thousands of best-in-class organizations (top 10%) with whom I worked in my 35 years as a culture and employee engagement consultant. Empower your employees to accept ownership for their own engagement. The full engagement solution does not rest solely on the shoulders of management, but rather, actively includes the employee in the solution. So many organizations have yet to employ this sage tactic. Try sharing this quick assessment with your employees, to help them discover their own level of job engagement, and receive tips on what they can do to find more meaning and satisfaction at work. Find supreme excellence and alignment during the recruiting process. The fact that 59% of all new hires are gone within a year1 underscores the single greatest mistake organizations make vis-à-vis engagement: they hire the wrong people. During my career as a culture and employee engagement consultant, I noticed a consistent commonality among our best-in-class clients: they all applied great scrutiny to evaluating each job candidate they interviewed and never “settled” by overlooking candidate flaws or red flags during the interview process. In short, they took the advice I gave thousands of clients over the years: “If you are going to spend the time, money, and energy building a magnetic culture, you should only let magnetic people in.” Yes, be selfish. Be wonderfully selfish. You and your team deserve it. As an employee engagement keynote speaker, I am very surprised to field questions on how to coach an “old time senior leader” on letting go of rigid workplace policies and work hours. Premier cultures prize offering flexible work hours, as well as work-from-home benefits. Given that job stress/work life imbalance is the number one reason employees resign2, affording workplace flexibility is a strong enhancement to culture. This tip is also a best practice given the expectations the two youngest generations of workers, those being Millennials and the generation after them, Gen Z. Telling these two generations that they have set work hours and that they are not allowed to work from home is their definition of a workplace prison. 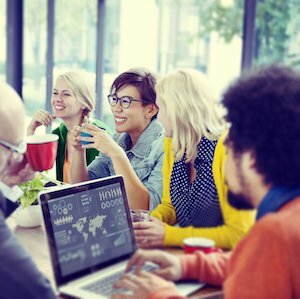 If some members of your team need convincing on the value of workplace flexibility when it comes to company culture, read my blog post “Have a manager who is opposed to virtual work?” and use it to convert them; it well illustrates the immense benefits of workplace flexibility, virtual work, virtual employees, and virtual teams. Any workplace culture that eschews diversity & inclusion (D&I) is a doomed one. The world is as diverse as it has ever been, and great organizations proactively initiate efforts on cultural diversity to reflect that reality. Multiple research studies have reported a proven linkage between diversity & inclusion and employee engagement. Thus, if you care about talent attraction and talent retention, which are synonymous with employee engagement, you better also care about D&I. This is another proven secret when you’re trying to figure out how to improve company culture and performance. Raising the bar on oneself and one’s workforce is the second of the aforementioned three commonalities of best-in-class cultures and organizations. The CEOs and management teams of world-class cultures consistently raise the bar on themselves and their teams. Typically, when I presented an organization’s employee engagement survey scores to them, I could tell them they scored in the 97th percentile (top 3%) and invariably their CEO would congratulate his/her management team and then announce “But we are not done yet. We want to be at the 99th percentile next year.” Great cultures do not shoot for average. Instead, they aim for the pinnacle of excellence, and ultimately, they achieve it. Recognizing again that the single greatest reason people quit is job stress, what better medicine for that than fun? People love to have fun and share some laughs when they’re working, but sadly, hundreds of millions toil through sad, stressful, and torturous workdays. Day, after day, after day. Sadder still is the fact that most of these people accept this drudgery as a reality that they must accept. We spend so much time at work so don’t we deserve to have more fun while we work? We most certainly do! And yes, you guessed it: leveraging fun is the third commonality among best-in-class organizations. When you understand how to improve company culture by focusing on employee engagement, it’s much easier to find actionable ways to move the needle and make a real impact. Even stepping it up on a couple of these options should make a difference at your organization. This entry was posted in Blog and tagged company culture on February 12, 2019 by Kevin Sheridan.